Tirupati in Andhra Pradesh is a popular Hindu pilgrimage city thus a huge number of devotees come here to seek divine blessings every day. Apart from the famous Sri Venkateswara Temple, Tirupati has several other attractions like Talkona waterfalls, deer park, Sri vari Museum and more. 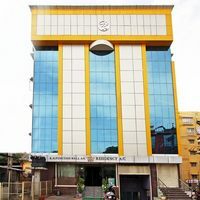 Throughout the year, the city is full of visitors especially from August to March that is why finding a perfect Tirupati hotel can sometimes become difficult. If you book in advance, then you can enjoy a hassle free stay. At Cleartrip one can book from best Tirupati hotel in all budgets. So, no matter what your budget is, you can find a perfect hotel for a comfortable stay. 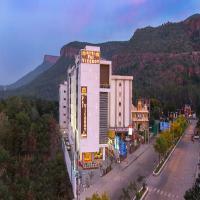 You can find hotels in some of the best locations near some of the famous landmarks in Tirupati at Cleartrip. 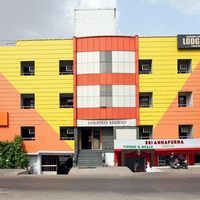 Cleartrip offers you a list of top hotels in Tirupati from budget hotels such as 2-star hotels to luxurious 5-star hotels, guest houses, and home stays too. If you pre-book your hotel 2 weeks before you trip, you can surely grab the best hotel deals. Simply browse our site, specify your budget and other preferences to get a complete list of hotels in Tirupati. Shortlist as per hotel facilities, pictures posted and reviews to take an informed decision. Tirupati has a various temples to visit thus you can choose a hotel nearer to these pilgrimage sites or near bye pass, bus station or any other landmark. Book your Tirupati hotel today! Tirupati is a city in the Chittoor district of Andhra Pradesh. It is the ninth most populous city in the state and is considered one of the holiest places in India. Among various temples here, the Tirumala Venkateswara Temple is the most popular among devotees. Titupati is named as the “best heritage city” by the Ministry of tourism and is also known as the spiritual capital of Andhra Pradesh. Under the India Government, Smart city Program, Tirupati has also been listed among the 100 Smart cities of the country. According to Varaha Purana, Lord Rama stayed here with Goddess Sita and brother Laxman when they were returning back from Lankapuri. 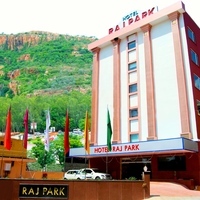 There are around 80-90 hotels in Tirupati of all types and budgets. Most hotels offer all the basic amenities to the visitors for a comfortable stay. More than half of the visitors are pilgrims. Hence everything is provided while keeping their needs in mind. If you are travelling to Tirupati anytime soon, you can book your accommodation through Cleartrip and avail the best deal. 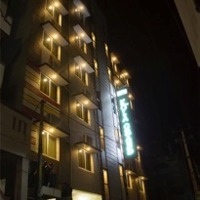 You can choose from budget hotels to star rating hotels depending upon you budget and preference. You can also choose to stay in a homestay or Dharamshala. There are several key locations where one can book hotels in Tirupati. Weigh the pros and cons of each before booking your hotel. visiting it is advisable to book a hotel room in advance. Most of the people plan their travel according to their budget. To ease the process they can use the price filter at Cleartrip site and get the rooms within their budget. 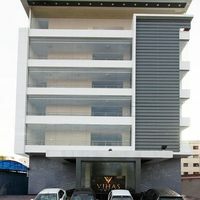 : If you want a luxury stay in Tirupati, go for a 4-star, 5-star or boutique hotel that will make your trip a memorable one. 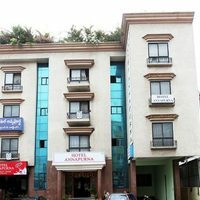 Hotels Near Chandragiri Fort: You can consider booking a hotel near Chnadragiri Fort as it is one of the most visited tourist attractions in the city. The airport is just 16 Km from the city centre. There are frequent flights available from major cities such as Chennai, Hyderabad and Bangalore. The nearest adjacent airport is Chennai where many flights take off. One can easily reach to Chennai via air and then to Tirupati via road. The railway station is just 15 km away from the city. The city is connected with all the major cities, such as Chennai, Visakhapatnam, Madurai, Bangalore and Mumbai via rail. If you want to reach Tirupati by road, there are bus services, which connect Tirputi with other major cities so that one can easily reach to Tirupati at a low cost. You can also reach by your own car or taxi, if you are in a nearby city. The temple has become very popular because of the historical importance of the Sri Venkateswara Temple. The temple is spread in an area of 22 acres. It is considered the richest temple in the world and is second most frequented shrine in India. The water here falls from a height of 270 feet. The spectacular view of the waterfall will capture your heart. As the name suggests, the Deer Park has a wide range of the animals which make it a must visit place. This is one of the most famous tourist destinations in Tirupati. 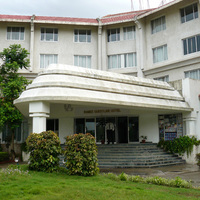 The museum is situated in Tirumala. The place has a fine collection of sculptures, photographs, pictures and scriptures thus one can know more about Indian history by visiting this place. Kullottunga, the famous Chola king had built this temple in the 11th century while the temple was further developed in the 14th century by the kings of Vijayanagar. As it is known as a temple town, all the Hindu festivals are celebrated here. Sri Venkateswara Brahmotsavams is one of the main festivals celebrated here with excitement and pride. 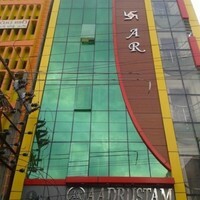 Some of the best shopping places in Tirupati are Bazaar Street, Pasuparthy Super Mart, etc. The best thing to buy from here is the hand-made handicrafts as it is the home to the most skilled craftsmen. Tirupati is famous for its vegetarian food. The famous sweet item here is the Tirupati ladoo. The city is at a distance of about 140 km from the town, is famous for its culture, tradition and sandy beaches. Triputi has a tropical wet and dry climate. Usually summers occur in March and last till June and from October to February, it is winter season when the temperature remains between 18 and 20 degree Celsius. The monsoon season starts in July and the city experiences heavy rainfall in the month of November. While in Summer, the average temperature lies between 37 and 40 degrees Celsius and decreases in July because of the rain fall. This is the ideal time for visiting temples are other sites. Hotels are packed with tourists during this time so one should book a hotel room in advance. The climate is pleasant and but the city receives heavy rainfall. Summers are hot and humid in Tirupati. Car procession is the highlight of the festival and considered one of the main events in Tirupati. During this event, the city is filled with positive energy. The festival lasts for three days and is celebrated every year. The day celebrated to coincide with the migration of the Siberian Crane and other birds as the name suggests. What is the best time to visit Tirupati? Summers in Tirupati are hot and humid and the weather conditions continue to be the same in rainy season as well. Thus, winters, from November to February, are considered the best time to visit Tirupati. Which are the top 5 must-visit places in Tirupati? Sri Venkateswara Temple, Talakona Waterfalls, TTD Gardens, Deer Park, and Sri Vari Museum are the top five must-visit places in Tirupati. How can I get attractive discounts on hotels in Tirupati? Go through the online travel sites like Cleartrip, which offer a range of options from budget hotels to star rating hotels in Tirupati. Go to the Hotels page , compare the hotels and book that fits your requirement using a valid coupon code to avail the best deal. Can unmarried couples stay in hotels in Tirupati? Yes, there are some hotels in Tirupati that allow unmarried couples to stay. However, ensure that you carry your valid ID proof (such as voter ID, Aadhar card, etc) to show at the time of check in. How can I find hotels near Renigunta Road, TIrupati? 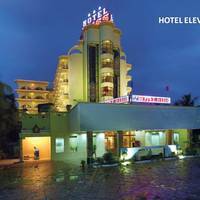 It is easy to find hotels near Renigunta Road, Tirupati on Cleartrip. All you need to do is enter the locality in the Where field option on the Hotels Page. 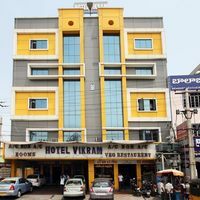 The lists of hotels located near Renigunta Road, Tirupati will be displayed in the search results and you can book as per your budget and choice. How do I book hotels in Tirupati near Tp Area? On the Cleartrip website hotels page, type hotels near Tp Area in the Where location filter. Lists of all the hotels near the specified location will be displayed for you to choose one as per your choice and budget. 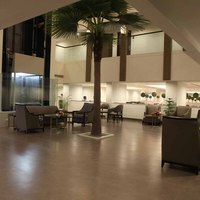 Do Tirupati Hotels offer Wi-Fi access? here are many hotels in Tirupati which offer Wi-Fi facility to the guests. However, one must contact the hotel to conform on this matter before booking. What can I buy from Tirupati? Some of the best things to buy from Tirupati are handicrafts, traditional items, devotional CD's, and many more. Can you tell the best places to enjoy nightlife in Tirupati? The nightlife of Tiruapti is truly amazing. To enjoy the best nightlife in Tirupati, one can go for Neptune Bar, The Regal Bar, Relax Speed Bar and many more. Can you list the top 5 shopping markets in Tirupati? The top five shopping places in Tirupati are Bazaar Street, Pasuparthy Super Mart, Sri Yoga Book Centre, Chandana Ramesh Shopping Mall, and Music World. What are the famous sightseeing spots in Tirupati? Tirupati offers some exciting sightseeing spots to visit such as Tirumala Temple, Sri Padmavathi Ammavari Temple, Silathoranam, TTD Gardens, and many more. Do hotels in Tirupati have coffee shop? Yes, there are many hotels in Tirupati which have coffee shop. Fortune Select Grand Ridge, Fortune Kences, Minerva Grand Tirupati, Hotel Regalia are few options where you can find coffee shop. For more options, you can visit Cleartrip. Suggest a few top party places in Tirupati? 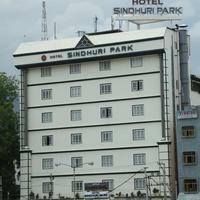 There are many economical and high-end pubs, bars and lounges in Tirupati. One can choose from a range of pubs such as Neptune Bar, Madhuvan Bar, Eden Park Bar And Restaurant, and many more. Can you list some of the best hotels in Tirupati? Some of the best hotels in Tirupati are Fortune Select Grand Ridge, KVP Residency, Fortune Kences, Minerva Grand Tirupati and Best Western Tirupati. 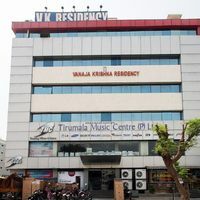 How to book a room for international guests near Renigunta Road, Tirupati? 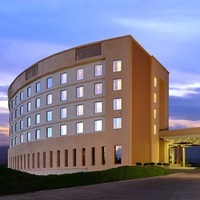 Go to the Hotels page on Cleartrip website and select Renigunta Road from the landmark dropdown. The list of hotels in and around the locality will be displayed and you can book the one that is best suited for international guests. Which are some of the budget hotels in Tirupati? 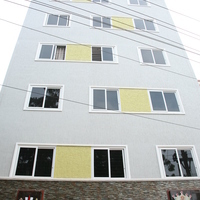 Hotel Jayasyam Inn, Hotel Vikram, Hotel Sai Sravanthi Grand are some budget hotels in Tirupati. 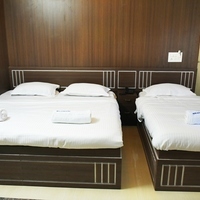 For more options, click the budget hotels in Tirupati . Can you list some best hotels in Tirupati near Akkarampalli Post? Can you name some 4-star hotels in Tirupati? 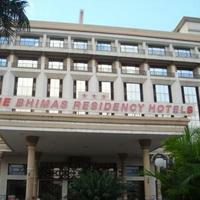 There are a total of two 4-star hotels available in Tirupati. You can either go for Hotel Bliss, or Fortune Kences, whatever suits your requirement the best. Which are some good Fortune hotels in Tirupati? Do Tirupati hotels offer pool facility? There are many hotels in Tirupati which offer pool facility. 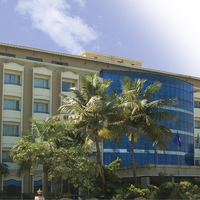 Fortune Select Grand Ridge, Hotel Bliss, Marasa Sarovar Premiere, Ramee Guestline Hotel are some options to choose from. Visit Cleartrip to book hotels with pool facility in Tirupati . How far is Tirupati Venkateswara Temple from Tirupati Balaji Temple? It takes approximately 7 minutes to travel from Tirupati Venkateswara Temple from Tirupati Balaji Temple and the driving distance between the two places is about 2 km. Suggest a few top temples in Tirupati? Popularly known as a religious town, there are many temples where every tourist should visit while in the town. Sri Kapileswara Swamy Temple, Tirupati Balaji Temple, Sri Govindaraja Swamy Temple, Sri Padmavathi Devi Temple are a few top temples in Tirupati. What activities and experiences can I enjoy in Tirupati? You can go on religious tours to explore the Hindu religion, munch on some delicious food, or go shopping in local markets in Tirupati. What are top places of interest in Tirupati? Tirumala Venkateswara Temple, Temple of Padmavati/Tiruchanur, Tirupati Balaji temple, Sri Kondandarama Swamy Temple are few top places of interest in Tirupati. Can you list some hotels near Tirupati Airport? Do check out some hotels near Trupati Airport like Keys Select Hotel Vihas, Fortune Select Grand Ridge, Marasa Sarovar Premiere. Visit Cleartrip for more details on Hotels near Tirupati Airport. How is the nightlife at Tirupati? Being a religious place, nightlife options in Tirupati are quite limited and restricted. However, you can relax and unwind at some of the bars and pubs available in Tirupati. Is alcohol facility available at Tirupati Hotels? Tirupati is a sacred city and thus, there are limited places where you can get alcohol. It is best to confirm with the hotel staff before confirming the booking. Is non vegetarian food available at Tirupati hotels? Tirupati is a religious town and thus, there are limited food options for non-vegetarians. However, there are a few hotels that serve non- vegetarian dishes. You can enquire about the same while booking your hotel. Do Tirupati hotels offer parking facility? 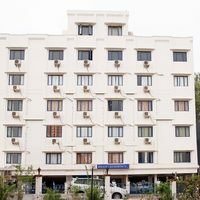 While booking a hotel in Tirupati at Cleartrip.com, you will come across the facilities from where you can check if parking facility is available or not. You can, also, get in touch with the hotel staff to confirm on this. Where can I go for weekend getaway from Tirupati? Bangalore, Chennai, Pondicherry, Mahabalipuram, Yercaud, and Kovalam are some of the best weekend getaway destinations around Tirupati that will leave tourists spellbound.